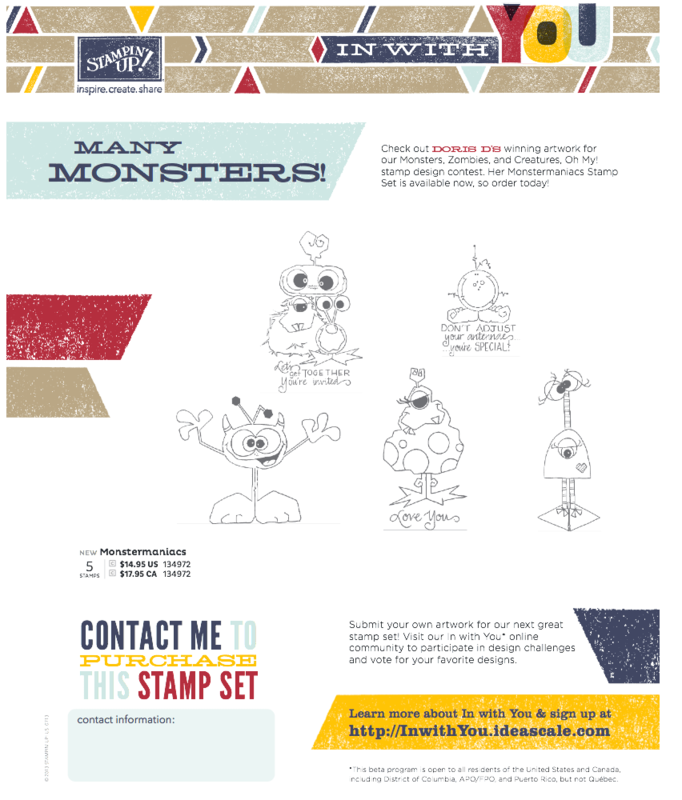 The Monstermaniacs Stamp Set #134972 is the most recent winner of our In with You Design Challenge. The set is now available for you to purchase. 1 WHAT IS THE “IN WITH YOU” CONTEST? WHAT IS THE “IN WITH YOU” CONTEST? We’ve created a way for you to help us design and choose new stamp sets–In with You (beta program). Our artists have no shortage of stamp set ideas, but this contest gives us a chance to innovate with our customers in a social media setting–and get their perspective and endorsement before the set is available. The In with You program is currently open to anyone (demonstrators, customers, etc.) in the United States and Canada, including District of Columbia, APO/FPO, and Puerto Rico, but not Québec. So spread the word! Once you join our In with You online community, you can submit your original artwork for stamp set challenges, vote and comment on other people’s submissions, earn badges, and interact with others in the community. We will produce and sell one or more stamp sets from among the top-voted submissions in each challenge. Plus there are fabulous prizes for top designs. For more information, submission guidelines, terms and conditions, and to participate, go to http://inwithyou.ideascale.com. What a cute set of monsters. I love the monster on the bottom left. Doris D did a great job. Thanks Tami for sharing her work. This is an interesting concept. I’m off to check the guidelines. Cute monsters. Wish I were an artist!! !